I want to introduce you to my bicycle. I can’t remember how we (Brian and I) acquired it, but I do know that I have had it for many, many years. When my son and daughter were little, I had a child-seat bolted to it and as they were big enough to ride on their own two wheeler, the bolts were removed (along with the seat). Additionally, it sported a small, white basket attached to the handle bars which had a blue license plate on the front with the name, “Dorothy”. This bike has been a friend to me all these years, getting me to and fro and back again as I so desired. Its little basket has held more weight than it should because I would load it down with treasures from the store or the farmer’s market. It accompanied the children and I many a times to our local California Mission, and waited patiently outside as we contemplated man’s adoration of G-d as painted on the chapel walls. The Raleigh has doubled as a dirt bike, beach cruiser, mountain bike, and exhibition parade rider. It is small but perfectly sized to me. Now this past Christmas my loving husband totally, thoroughly, and completely bombed on his gift to me. That is right, I did say “bombed”! He bought me a pair of Jessica Simpson brand pumps. They were water colored and extremely high. So high heeled, in fact, I could have put them on and just stood in one place…that is all. Not to mention my style is rooted in influences OTHER than Jessica Simpson, so needless to say I made no qualms about my complete disdain with his erroneous purchase. My husband now stands corrected. And in all honesty, the only thing I really wanted (besides a Clarisonic, Yves St. Lauren dress–or Dior for that matter, an excursion to the Greek Islands, five million cash, or a house on the beach) was to have my little Raleigh bike spruced up and new tires put on it. …after a year spent land locked to my feet, I am ready to feel the ocean breeze in my face as I ride, ride, ride. So after belittle-ling the multi-colored street walkers I had just been given I told him my bicycle could use some lovin’. His response was, “well geez, that is easy…I can do that right now!” And you know what? He did. …what a guy, the best in the west–for me!! 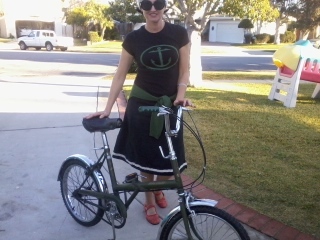 So here I am with my shined and ready Raleigh. The basket was too sad to keep, but “Dorothy” is patiently awaiting her new replacement. Today I read a vehicle license plate that asked, “Got Hope?” And since the owner of the car was posing a random question, I in turn, felt obligated to answer. “No, hope was yesterday. Today I ‘got tired'”. Yet me being who I am–a person who abhors the overuse (or use even), of lackadaisical terms such as “got (anything)”, especially as those types of faddish word phrases somehow manage to become integrated into everyday language–proceeded to hypothetically chastise the owner of the car and his or her misuse of the English language. Well my rant and rave was a little better in person, just ask Cole, he was there. Though I don’t know he would vouch for me in the positive…he did keep mentioning something about the mental institution, but I was so distracted by gotting hope that I didn’t pay him any mind. Or is it, I didn’t pay him no mind? Or how about, I didn’t pay him a mind? No, no, no. It’s, I ain’t got no more mind! And that folks is a ranting from one tired and cranky Rivka!!! What I thought was going to be my “free” day ended up being a day full of unexpected and lengthy interactions. They weren’t bad interactions mind you, but unexpected just the same. And as a result, my kitchen counter is doubling as my office and (un)-filing cabinet. The pans on the stove are no longer discernible between clean and unclean (not to be confused with kosher, non-kosher). And my head is a swirl with my old ‘to do’s’, my new to do’s, and all the upcoming potentials (of to do’s). And this morning, to kick my attitude off just right, I had a realization that I am not a princess! That is right, I somehow prior to this morning had mentally concluded I was a royal. But this morning I looked down and my legs were not shaven. Apparently my shaving maid does not exist and in my new awareness I am now the responsible party for keeping the forest at bay. However, being that I had not mapped out my morning for such peasant-like, labor intensive duties, I quickly found some (thankfully) clean leggings and sported an outfit befitting my new ‘lower calling’. So here I sit in the luxury of my facade–(you see, my bed is so fluffy and big it suggests royal palace…you can see where my confusion began)–contemplating my “new” position in life. Oh dear, that means I will have to shave my legs tomorrow…another job to add to my list. Now can you understand how this day has come and gone without mercy? The Lord’s mercy I have received anew this morning, but the day itself has proved brutal!